According to the latest report by Colliers International, during the first half of 2016, some 12,000 square metres of modern office space were completed in Prague. An additional 20,300 square metres is expected to follow during the second half, which will lead to 2016 being the “leanest” year in terms of development completions since 1992, with a total of only 32,300 square metres of completed offices. In 2017, Colliers International forecasts the completion of at least 15 new and refurbishment projects in Prague totalling some 175,000 square metres, which represents a minor increase in comparison with the ten-year average for completions between 2006-2016, which stands at approximately 151,500 square metres of office space per year. A similar level of completions can be expected for 2018 and onward. Relatively high competition on the office market has led developers to focus on projects that mimic the latest trends across the most developed markets, in terms of design, ecological benefits and social aspects. 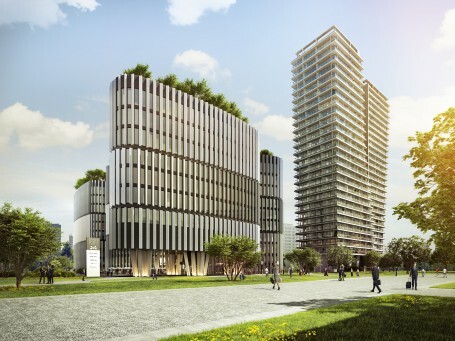 One such project that encapsulates the “office space of the future” is Prague’s Main Point Pankrac by PSJ Invest spanning a total area of 24,500 square metres, making it the largest project to be completed in 2017 in the Czech capital. Designed by DaM architects, Main Point Pankrac consists of five interconnected elements over ten floors offering a range of amenities to improve the work environment, such as rooftop gardens and panoramic elevators providing a view of the surrounding area, as well as sustainable solutions that lessen the need for artificial lighting, lower noise levels in the workspace and better equalize internal temperatures. Besides increasing employee satisfaction tenants can also benefit from considerable operational savings. For the latest news from Colliers, visit Colliers.com or follow us on Twitter: @Colliers and LinkedIn. To see the latest news on Colliers International in the Czech Republic, please visit colliers.cz.